Khamenei, Iranian regime’s Supreme Leader, speaks on the anniversary of the death of Khomeini, his predecessor. Supreme Leader of the Iranian regime, Ali Khamenei spoke at an event on Monday, May 4th, to acknowledge the death of the regime’s founder, Khomeini. He used the occasion to address the threats his clerical regime faces in Iran today. 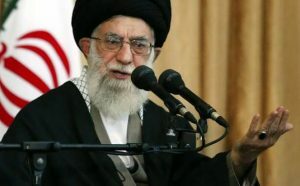 Khamenei spoke of the People’s Mujahedin Organisation of Iran (MEK), the orchestrators behind many of the recent protests and focal point for the Iranian opposition. He insisted that the rivalry between the regime and the MEK has been present since the regime’s founding days under Khomeini. He said, “Since day one after the revolution, hypocrite groups [the derogatory name regime uses doe MEK] have existed, making a stance against our Islamic state and… creating problems for us”. After acknowledging the MEK and the threat it poses to the regime, Khamenei moved onto the difficulties his regime faces abroad. With the US now out of the Iran deal and economic sanctions about to come into effect, he warned his supporters of foreign governments and their influence. He accused “foreign governments” of “imposing a disfigured deal to our country”. However, Khamenei did concede that the Iranian people had been protesting the corrupt regime. While trying to blame outside powers for it, he acknowledged that recent protestors in Tehran had expressed anger at regime’s meddling in other parts of the Middle East. He said, “one day in Tehran’s streets… we witnessed people chanting “Not Gaza, Not Lebanon”. He also addressed claims that the recent protests had included protestors from all walks of Iran life. He refuted the claim and described it as an enemy conspiracy. He ended the speech by threatening other countries. “The enemy knows if they launch one missile, we’ll launch dozens back”, he said. Interestingly, the regime-affiliated Fars news agency titled the piece covering Khamenei’s speech, “If they launch one missile, we’ll launch two”. It’s now a fact that the regime uses similar rhetorics everytime in crisis, in order to cover up the deepening crisis that has engulfed the regime, given the sanctions and the rising protests across Iran. 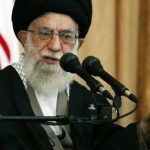 Washington post quoting an expert on Iran, regarding similar threats by Khamenei on regime’s reaction to the extension of sanctions after the U.S. pulled out of JCPOA, wrote: “The supreme leader’s threat to step up enrichment is an attempt to use nuclear blackmail to force Europe to save his regime from an economic and political crisis of his own making”. This is while experts consider the Iranian regime’s ICBM program, affiliated to its nuclear weaponry program. Khamenei ended his tirade with another attempt to destabilize the wider region. He spoke in Arabic and called on the region’s Arab youth to rise up against their governments. His comments are yet another example of the Iranian regime’s meddling in international affairs and deliberate undermining of other governments in the Middle East.